Add a decorative touch to your home or office and improve the overall environment when you leave out Decorative Bamboo Charcoal. 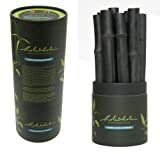 These highly sustainable carbonized bamboo stalks from the southern coast of Korea naturally filter and deodorize the air, absorb electromagnetic radiation, regulate humidity, and release negative ions FAR infrared radiation. You can even put them in a pitcher of water to purify and add minerals to drinking water as well. I'm thinking of putting a couple of stalks in every room - can't hurt and they have a really cool look. Absorbs harmful chemicals and substances from the air. Absorbs odors from around the house including bedrooms, closets, bathrooms, the fridge, laundry room, garage, basement, etc. Releases negative ions that freshen the air and FAR infrared radiation that helps you relax, eases joint pain, and improves circulation. Many electrical appliances emit electromagnetic radiation that can raise your body temperature and cause backaches. Bamboo Charcoal absorbs this radiation, helping to improve the environment in your home and office. Absorbs excess moisture in the air, and then releases moisture when the air becomes too dry, helping to regulate overall humidity levels in the room. AIR FILTRATION: Absorbs harmful chemicals and substances from the air. DEODORIZATION: Absorbs odors from around the house including bedrooms, closets, bathrooms, the fridge, laundry room, garage, basement, etc. RELAXATION: Releases negative ions that freshen the air and FAR infrared radiation that helps you relax, eases joint pain, and improves circulation. ELECTROMAGNETIC SHIELDING: Many electrical appliances emit electromagnetic radiation that can raise your body temperature and cause backaches. Bamboo Charcoal absorbs this radiation, helping to improve the environment in your home and office. HUMIDITY REGULATION: Absorbs excess moisture in the air, and then releases moisture when the air becomes too dry, helping to regulate overall humidity levels in the room. Use 2 or more in larger rooms. Very effective in the bedroom, kitchen, family room, living room, basement, and bathroom.